How diversified should a mutual fund be? Typically, diversified equity funds hold 40-60 securities and are seen as bearing lower stock selection risk. Diversification is an important parameter to evaluate a mutual fund portfolio. A diversified portfolio implies lower risk since the poor performance of one or a few holdings will be compensated by the better performance of others in the portfolio. The downside to a diversified portfolio is that the advantage from the outperformance of some securities will be limited since they are only a small portion of the portfolio. The extent of diversification in a portfolio is driven by the strategy adopted by the fund to generate returns and manage risks and the market segment in which it invests, among others. To do a meaningful evaluation, you must understand the nuances in diversification across different types of funds. Number of securities: The most obvious indicator of diversification is the number of securities that the portfolio holds. Equity mutual fund portfolios with 25-30 securities are seen as concentrated and that’s usually the result of a stated strategy of the fund to generate returns from such focused portfolios. “I like small portfolios of not more than 25 stocks because they reflect the conviction of the fund manager in their selection," said Shyam Sekhar, chief ideator and founder, iThought. Typically, diversified equity funds hold a larger number of securities—between 40 and 60 stocks—and are seen as bearing lower stock selection risk. Dilshad Billimoria, director, Dilzer Consultants Pvt. Ltd, a Sebi-registered advisor, likes mutual fund portfolios that are not too unwieldy to ensure proper attention from the fund manager. “A 30-50 stock portfolio is what I find ideal," she said. Allocation to securities: Diversification can also play out in terms of the percentage allocation to the securities in a portfolio. A portfolio having a large number of securities but with 60-70% of the assets held in the top 10 securities is not really well-diversified. For example, HDFC Equity Fund holds a portfolio of 46 stocks currently but 60% of the portfolio is held in the top 10 stocks. However, the number of securities held in a portfolio and its percentage holding is also a function of the market segment in which the fund invests. Portfolios that hold large-cap stocks have a larger pool of good quality stocks to select from and may, therefore, have greater diversification in the portfolio. Given the quality of stocks in this category and lower risk, large-cap fund managers may also be more willing to hold a larger portion of the portfolio in a smaller list of curated stocks. For example, The JM Core 11 Fund holds 11 stocks and the Aditya Birla Sun Life Focused Equity Fund holds a tight portfolio of 29 stocks currently. “You take exposure to a set of high conviction ideas," said Mahesh Patil, co-chief investment officer at Aditya Birla Sun Life Asset Management Co. Ltd. “If the stock picks are good then there is the opportunity to generate significant alpha vis-à-vis the benchmark," he added. The flip side is that if the stock story does not play out as expected for even a few stocks, the impact on the returns can be considerable. “We use a bottom-up stock picking strategy and sector diversification to mitigate these risks in Aditya Birla Sun Life Focused Equity Fund," said Patil, about the fund’s strategy. “Investors need to know that there can be short-term deviations relative to the benchmark in concentrated portfolios." Given liquidity concerns in the mid- and small-cap segments, mutual funds invested in these typically choose to hold a larger number of stocks to avoid the risk of over-exposure to illiquid securities. “A long tail is unavoidable in these schemes," said Sekhar. L&T Midcap Fund and Kotak Emerging Equity Scheme, among the top performing funds in the mid-cap space, are invested in 78 and 61 securities, respectively, with the top 10 securities accounting for just 23% and 31% of the portfolio. Sectoral allocation: Apart from individual securities, look at sectoral allocations too. Most diversified equity funds have around 50% of their assets concentrated in the top three sectors they invest in. Sekhar prefers a portfolio well-diversified across sectors even if it does not reflect the index allocation to different sectors. Market cycles: In the initial phase of an upward trend in the economic cycle and the markets, you may see portfolios being more concentrated in large-cap stocks, but as the bullish trend intensifies, you see diversification into mid- and small-cap segments. Again, in a downward market and economic phase, you may see portfolios becoming more concentrated in good quality stocks. A large corpus size is an advantage for debt funds since it allows for better diversification. But how a debt fund chooses the categories to invest—such as money market instruments, government securities (G-secs), credit exposure and cash—has to be driven by its investment objective and not by diversification alone. For instance, a liquid fund will hold much of its portfolio in treasury bills and other money market instruments to ensure liquidity and will be unwilling to take on longer-term securities to avoid volatility. On the other hand, a corporate bond fund will take some exposure to G-secs to balance yield and liquidity needs; currently, this category of funds holds an average of 4.5% of the portfolio in G-secs. “You will find debt portfolios reasonably diversified," said Lakshmi Iyer chief investment officer for debt and head of products, Kotak Mahindra Asset Management Co. Ltd. Evaluate the exposure that a debt fund has to an issuer rather than to a security to correctly assess the risks from a downgrade; too much concentration in an issuer increases the risk in case of a downgrade. What you should also watch out for is concentration of the portfolio in sectors. While sector-wise categorisation may not be readily available, you can look at the securities they hold and do a quick calculation to see if the portfolio’s investments are concentrated in any particular sector such as financial services, housing or infrastructure. “Banks and NBFCs are the largest issuers of debt securities and it is natural to see a concentration in the financial services sector in the portfolio," said Iyer. Sometimes a portfolio may be taking too much exposure to cyclical industries or interest-sensitive sectors and a turn in fortunes of the sector will see a deterioration in the quality of a large portion of the portfolio. Look at the rating classification of the portfolio to assess the default risk that the fund manager is taking to benefit from better yield and the possibility of price appreciation in the event of a rating upgrade in any of the securities. But this also increases the risk of default in the scheme, and a rating downgrade can lead to a liquidity crunch, particularly if the portfolio has a large exposure to the security. 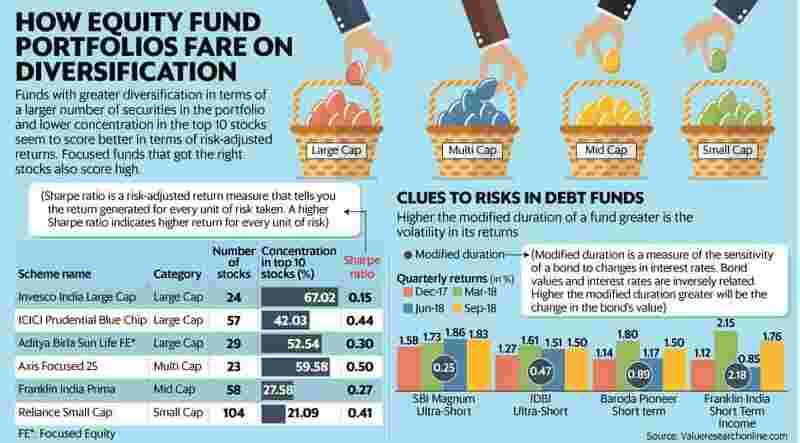 While capital markets regulator Securities and Exchange Board of India (Sebi) prescribes the duration exposure that each category of funds can take, there is no restriction on including lower quality paper in short-term debt funds, unlike in corporate bond and credit risk funds. Similarly, the regulations prescribe duration for a fund at a portfolio level. A long-term security, which can experience greater volatility in values, can still find a place in the portfolio of a shorter-term debt fund as long as the portfolio’s duration stays within the regulatory limits. Look at the quarterly returns for clues on volatility in returns. The securities selected for inclusion in the portfolio will drive the returns, and the extent of diversification, among other factors, will determine its risk. Understand how the portfolio is constructed to get the best fit from your mutual fund investments.